I started sailing in my mother’s womb on a Venture 21 that my family owned. We sailed out of Santa Monica and my die-hard father would sail the 22 miles to Catalina Island under sail alone. While his first passion was flying, he loved the purity of sailing. The boat had no motor at all. More than one night was spent becalmed in the harbor taking hours to get the half mile into the slip. During my late teens, some time was spent on Sabots and Hobie Cats on Mission Bay with friends. Finally, 20 years after I was born I bought my own Venture 21 and berthed it in Shelter Island in San Diego. We sailed that little craft many times a week and would take it out on the windiest days San Diego had to offer, which unfortunately are few and far between. But what a rush being out when the only other boats were the coast guard and navy seals. In addition to the Venture 21, I owned a Prendle 18′ catamaran that I sailed and raced for several years, and owned a couple zodiacs that we would use for diving and surfing trips. A good friend in my 20’s owned a 36 foot Lancer and I was fortunate that he allowed me to join him for several years of adventures. During that time I did my fair share of coastal weekend races and beer can evenings on many different styles and lengths of boats. It was typical that we would do a 2-3 week charter each year on boats like the 47′ Jeanneau sloop all of which I captained. 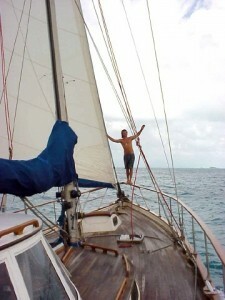 For three years I owned a 56 foot pilot house ketch in the Caribbean. This boat was a surfer’s journey boat called “Perfect Ride“, and resulted in many great surf sessions. I single handed that boat much of those three years and had friends on it as well. After a few decades of sailing 36-56′ mono-hulls, I have started to play on larger multi-hulls. For a birthday adventure we went to the Caribbean for two weeks and chartered a 46′ Leopard catamaran. That was in 2010. I am now spending time on a 44′ Antares catamaran Golden Glow and have completed 12,000 miles on her through the US east coast, Caribbean, Atlantic crossing and the whole length of the Mediterranean. Attached are some sailing check lists that I have compiled for the sailing I have done, hope they offer some help for those that are looking for a head start on various check lists used for cruising. More of these are available on the Golden Glow Sailing Checklists page of the Golden Glow Antares catamaran website.